Luxury five bedroom rental with amazing views. 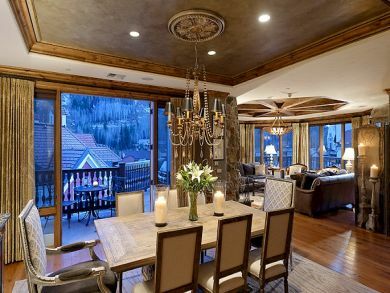 In this five-bedroom chalet you will find imported French and Austrian antiques craft the iconic warmth and character of the European Alps-in the heart of Vail Square, steps from the gondola. 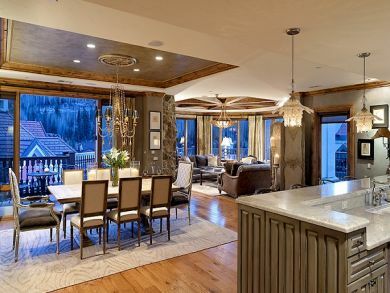 This Chalet is a luxurious five-bedroom private residence atop the award-winning Arrabelle Resort with striking ski mountain views from every window, two master suites, and a wraparound 270-degree terrace. On the top floor of the resort, the chalet offers 4,000 sq. ft. of living space with ski mountain and village views. 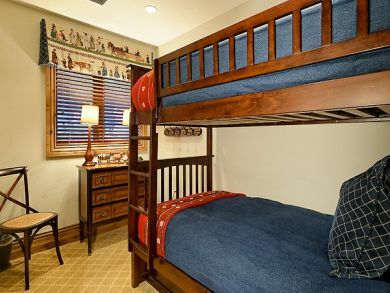 The Retreat can accommodate ten guests with traditional bedding and up to twelve guests utilizing bunk beds. Fully equipped with a commercial kitchen with barstool seating for four and a formal dining area that accommodates up to eight. Enjoy all of the amenities of a luxury home including a spacious Family Room with a stone fireplace and a washer and dryer inside the residence. Delight in the spectacular views from the three private terraces, offering outdoor seating and a commercial gas grill. 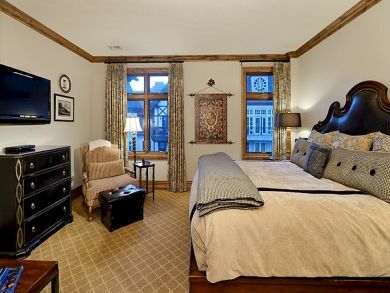 Resort Access Ideally located at the base of North America's #1 ski resort and just steps from the Eagle Bahn Gondola, The Arrabelle is inspired by the historic grand hotels of Europe. The resort offers a luxurious spa and fitness center and a rooftop pool. 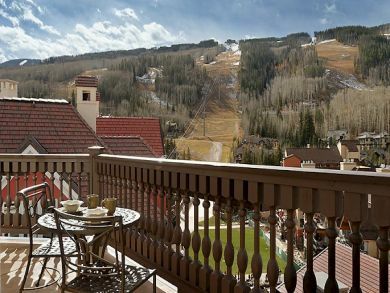 The Arrabelle at Vail Square was ranked #8 in 2011 by Condé Nast Traveler's Reader's Choice Award, "Top 50 Ski Hotels in North America." 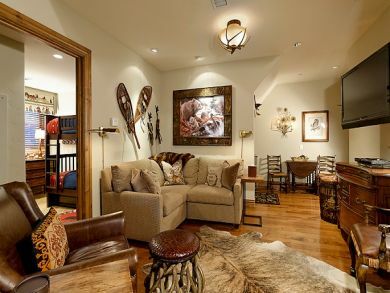 At your doorstep are a fire-lit après-ski deck, chic shopping and Vail's top cuisine. In-suite Services Include: 24 Hour In-Room Dining Complimentary Wi-Fi and Long Distance within the U.S. Daily Housekeeping Overnight Laundry Service Babysitting Services Private Chef Available Upon Request Bathroom Amenities Property Services Ski-In/Ski-Out Ski Valet/Ski Concierge Lift Ticket Services Ski and Snowboard Services Ski Rental Services Ski Nanny Valet Parking On-Site Dry Cleaning Services Concierge Services Executive Business Center and Library Children's activities Exclusive access to Red Sky Golf Club Luxurious Spa and Fitness Center Roof top pool and hot tubs Colorado Travel Guide Rocky Mountain Retreat Colorado is a nature-lovers paradise. The state with the highest elevation in the continental US features an astounding number of national forests and parks, historic trails, incredible rock formations, fossil beds, and even a few Puebloan villages. And then, of course, there’s the skiing – arguably among the best in the world. Colorado’s ski resorts are top-notch, and all offer a range of difficulty levels to suit the entire family, beginners and experts alike. 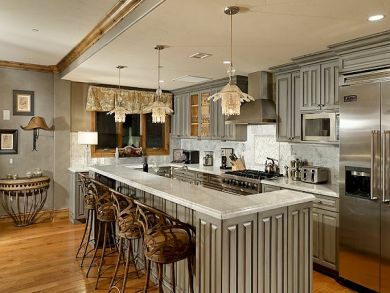 Our Colorado luxury villa rentals balance mountain-style living with the best of modern indulgences. 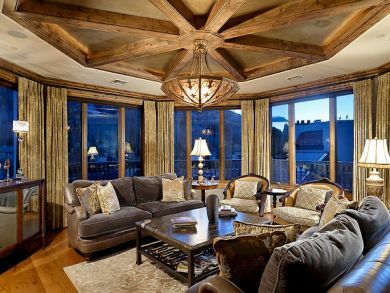 Imagine coming home from an exhilarating day on the slopes to a roaring fireplace and private theater stocked with your favorite films. 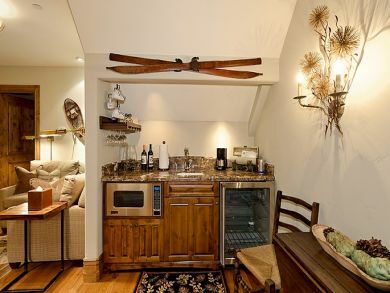 Dine on chef-prepared cuisine on your private patio to the backdrop of the spectacular Rocky Mountains, or unwind in your outdoor Jacuzzi while staring at the stars. 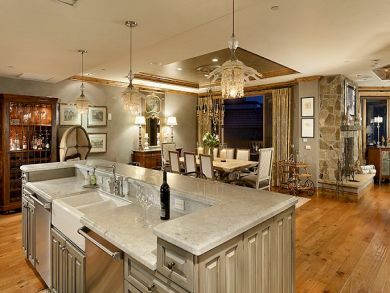 On a Colorado luxury villa vacation, rugged scenery meets pure indulgence – and the results, you’ll find, are simply heavenly. 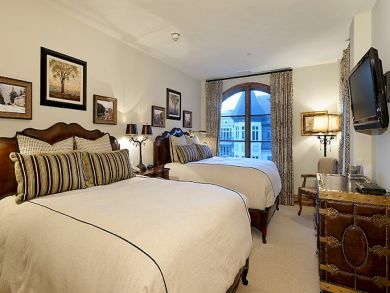 Average rate is $6250/Night. Plus taxes and fees. Rates vary by season and length of stay.